Just added a couple of Harris Tweed Satchels to the shop adorned with equestrian-inspired appliques for all you horse lovers out there. And now I'm off to my studio to complete some more handbags. Wishing everyone a great day! A while back I won a fantastic giveaway atLiPeony's blog and I was able to choose three prints from her lovely Etsy shop LiPeony. The one posted above called "Little Sewing Girl" is my favorite along with "Flipping Pancakes" and "A Marshmallow Incident." Her shop is filled with whimsical imaginative illustrations. They are quirky, fun and just delightful. You must check them out! My "Little Sewing Girl" print is displayed in my studio and inspires me to work. This morning I took some shots of the studio before I began sewing. It does get messier as the day progresses. But I will admit I do like things organized and clean so throughout the workday I am picking up bits of thread from the floor and putting things away that I am finished with so it does not get too unmanageable. If you are curious who won the World's Best Cat Litter Valentine's Day giveaway just head over to their blog! The prize is now on its way to the lucky winner. 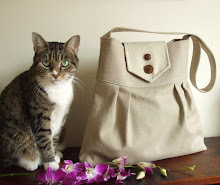 I enjoyed creating the feline-inspired bag for this giveaway. I now have a few kitty bags available in my shop. Please keep in mind that the butterflies always get away and the kitty stills has lots of fun! My Harris Tweed samples arrived today! You have no idea how excited I was when I saw a package waiting for me in my mailbox that traveled all the way from the Isle of Harris, Scotland. FIrst thing I did after I opened it was to arrange my samples by color on my cutting table in the studio. Like a kid in a candy store, I could not contain my excitement. Sampling them one by one in my hand, I imagined what they could be transformed into. I matched two colors up to each other and thought of a two tone bag. Another one, in a beautiful shade of heathered blue, I imagined adorned with a bird on a branch sitting against a blue sky. After a while my sugar high was so intense that I had to step away. I did manage to make a selection for my next order. I chose some gorgeous blues along with some other spring-inspired shades. It was so hard to make a decision since I really want them all! Galloping horses and kitties chasing butterflies can now be found in the Pesky Cat Designs shop. Don't worry, the butterflies got away safely and the kitty had loads of fun. Equestrian-inspired wristlets and purses are coming soon. Also in the works are a batch of wristlets in pretty springtime shades with flower appliques. You can still enter the giveaway at World's Best Cat Litter blog to win a Pesky Cat Designs feline-inspired messenger bag. The contest ends 2/21/2011. Best of luck! Head over to World’s Best Cat Litter™ blog to enter their Valentine's Day Giveaway for a chance to win an one-of-a-kind Pesky Cat Designs messenger bag! It was inspired by Anni, the sweet kitty of Pesky Cat Designs. 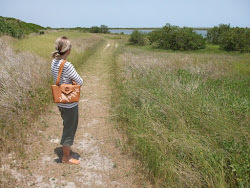 Read the story behind the bag here. Contest end 2/21/2011. Best of luck! Just added a couple of pretty spring purses in sage green and cherry red to thePesky Cat Designsshop. They are made from a fine quality linen-look upholstery fabric and adorned with a handmade leafed branch applique. Of course you can wear them any time of the year. They will brighten up your winter days as well! Yesterday I added the pair above to the shop. They are made from one of my favorite Harris Tweed weaves, the Macleod check. My Harris Tweed source is sending me sample swatches of plain weaves and checks available in their shop now. I can't wait to peruse them all! New Harris Tweed wool bags are now available in the Pesky Cat Designs shop. These are made from a lovely golden brown weave. Today I'm working on a pair in a Hunting Macleod tweed. Later in the day bags will be cut out in new spring colors. Wishing everyone a wonderful day ahead! Here's a sneak peek of the latest batch of handbags from the Pesky Cat Designs studio. They're made from Harris Tweed wool in a vibrant pink weave with the addition of a gray weave. The purse on the left is adorned with a wool felt applique and a coconut button. A sweet gray and white tiny polka dot cotton print fabric was used to line the interior of these bags. They will be available in my shop today.